This indicator will generate computer voice speaking when any changes occurred on MT4 terminal like telling you what is being done by your robot, such as the opening of new orders, cancelling a pending orders, and so forth. Sounds like useless, but it can make your MT4/5 terminal more fun and informative, so different from the others. This indicator has a rather large size but does not interfere with the performance of your MT4 terminal, because you do not need to attach this indicator to all charts, quite simply on one chart. This indicator can be equipped with additional voice files, such as your own voice files. 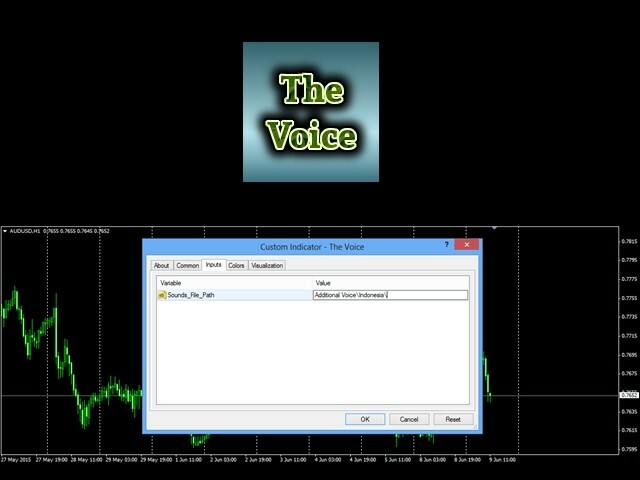 Additional voice files are also available in forexchip.com, just download, it's all free. If you want to use your own voice files, quite simply change the path in the input parameters, for example AdditionalVoice\Ownfiles\. The following are the names you should use for your own files to be functioning and put them into the directory. In this case the directory is MQL4\Indictors\Market\AdditionalVoice\Ownfiles.